I believe we're goin' places again this winter. I'm sure Linda will fire up her blogging machine soon with details. But it's time to revisit and collect lessons learned about having data while traveling abroad (or out of your carrier's service area). We wrote in detail about this topic while we were in the Caribbean and still stinging from some hard (and expensive) lessons. Here are a few more ideas. Our computers are Windows and our mobile devices are Android. Yes, we are fully on the dark side. Yes we are very happy to be on the dark side and don't need to be saved from this horror. I am certain that given how awesome MacOs and iOS allegedly are, that there are equivalent settings for most of what I show here. In fact they are probably much, much more superior and shiny. This is new in Windows10 and it's a great feature. When I wrote about this last time, I didn't realize how useful and important this was. But Windows10 is a downloading fiend if you don't enable this feature. You can designate any of your wireless connections as Metered. Windows treats these connections differently and the OS itself will do much less chatter over them. To set this up, just right click on the connection and choose properties. In the settings dialog, just flip the switch. This setting is per-user, so if you have multiple user accounts on your laptop like we do, make sure it's set for everybody.You also have to have admin privileges to make this change. On my work computer, I had to temporarily elevate myself to make the change. Don't tell the boss. 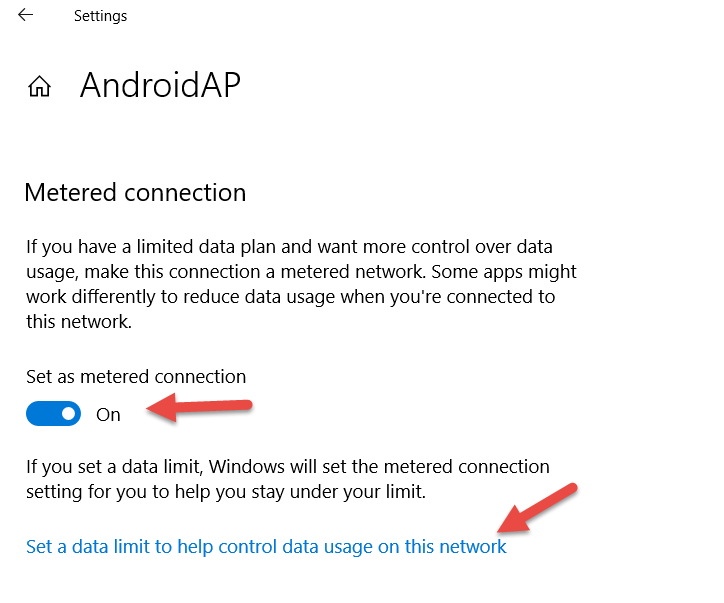 Note that you can also set a data limit per wireless connection. I don't do this myself because since I'm working along the way, running out is not an option. 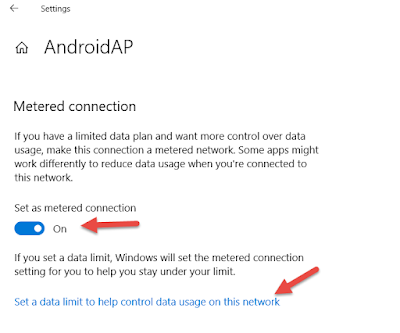 Some Applications like the Microsoft Office Suite pay attention to this metered connection status and will give you an opportunity to not use it. Probably other apps do or will soon start having similar prompts. If you are connected to an office and working while traveling, my condolences. But, if you are using Outlook at your company, you might want to ask your friendly (ha!) IT department if they've also turned on the Outlook Webapp. If they have and you really want to conserve, I strongly suggest using it rather than the Office Outlook Application. The Outlook Application is quite the little chatterbox. Warning: the user experience of using the outlook webapp is pretty miserable. You get used to it. It does all the bits you need but without the fluff. They way phones inhale data, it's almost as though they are connected to a limited costly mobile data plan. Oh wait... they are. One general thing you can do to reduce this is to turn off Automatic App Updates. If you're like me, you have a zillion apps and they are all doing periodic updates. In the App Store settings turn off Auto-update apps. But of course, you want your apps to update. This puts it on you to manually do the updates when you are sitting on some free wifi somewhere. I've been on mobile data for about ten days as I write this, and I see I have 36 pending updates. They will wait. Not everybody has Facebook, but for the 99.99999% who do, here's an important one. Facebook notifications burn up data. Not much per-notification, but if you have 70 friends who are all posting pictures of what they had for diner or their child's 39th week birthday, it adds up. On one of our offshore legs, I connected my phone to the satellite to do a quick email check to see if anything important came from our weather router. As soon as my phone found a network, ding, ding, ding ding... "Frank is interested in an event near you". "Mary had Oysters at an Oyster Bar - yum!!". I looked at the console in the satellite app and those two vital communications cost about $5. Go deep into the Facebook app settings and turn off Push Notifications. Again, turn them back on when you're on someone else's dime if you want to be sure not to miss anyone's cute cat pictures. Here's the tricky one. Phones and phone apps have settings that reduce data usage when not on Wifi. That's great, but if Phone A is set up as a Hotspot and Phone B connects to Phone A, Phone B thinks that's regular ol' free unlimited wifi and has a data party. For that reason, be aware of when one phone is connected to another and be mindful of what you do. For example Stitcher Radio will download latest episodes of every podcast in my playlist when it's on wifi. I probably don't want it to do that when that "wifi" is really just another mobile device. I have two dedicated Unlocked Hotspots. I never use them and are hereby offered free to a good home. These days there is no reason to buy one. A phone is essentially a hotspot with a little bit of voice sprinkled in (and GPS and Camera and Any apps you want) - for about the same price as a dumb hotspot. You can buy an unlocked low-end Android phone for a hundred bucks or less now. You may even find a dual-sim one for that price. Unlocked is the operative word. This means you can put any carrier's sim in it. Both of our android phones have been unlocked and both are dual-sim. Still, we travel with a third low-end android which we use as our travel hotspot. The main reason is that I don't like prying the back off of the expensive phones all the time as the sim-of-the-day is swapped in and out. As I wrote about before, the people behind the counter when trying to buy a PAYG (Pay as you go) Sim looked at us like we were from Mars when we tried to buy a sim for the hotspot. In many cases, provisioning the sim requires sending a text message to the device. While it is possible to do that with a dumb hotspot, it's a real pain - you need to log into it with your computer to read the text unless you have a really high-end hotspot with a screen that shows it - in which case again, why not just have a whole phone? My advice: Even if you hate hate hate Androids, buy a cheap Android 4G phone for travel. That is your hotspot. That is also a handy phone for any local calls you need to make. Pop in the sim-of-the-day and life is good.